This restaurant served an amazing tortellini with peas and bacon, in a homemade creamy white sauce that we pretty ‘soupy.’ You can make the sauce as thick or thin as you like! It works perfectly with tortellini or gnocchi. Or an other medium-sized pasta shell would work too! Cook the gnocchi as directed. Usually only takes 2-3 minutes after the water is boiling. Once they rise, remove from boiling water set aside on plate. Meanwhile, saute the bacon slices in a large 12-14″ skillet. Once cooked, remove the bacon and pat dry. Pour off most (but not all!) of the bacon fat. Run a knife through the bacon to crumble it. Let the gnocchi and other ingredients simmer in the sauce for a few minutes. Season with onion powder, garlic powder and salt and pepper to taste. If you want the sauce to be a little thinner, you can stir in a little more milk, until it reaches desired consistency. Prepare some other veggies or side salad. 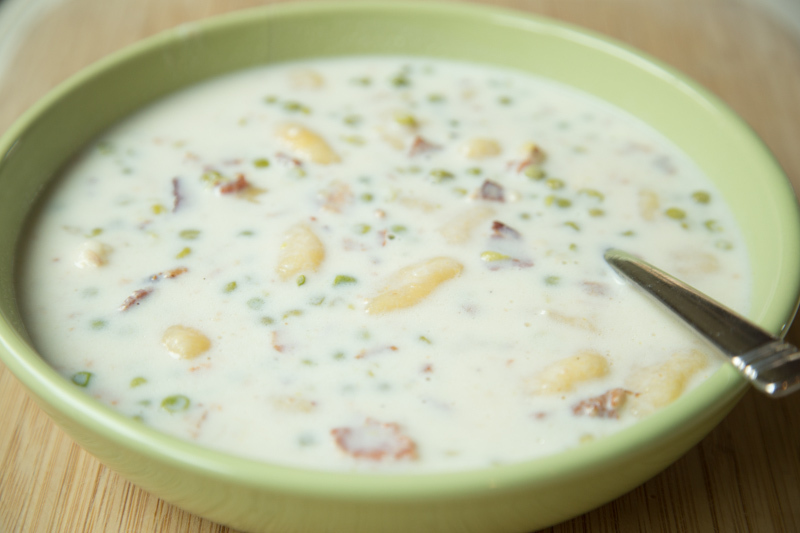 Serve Creamy Gnocchi with Peas and Bacon and side of veggies/salad. I am so glad to have found your site,the recipes especially! 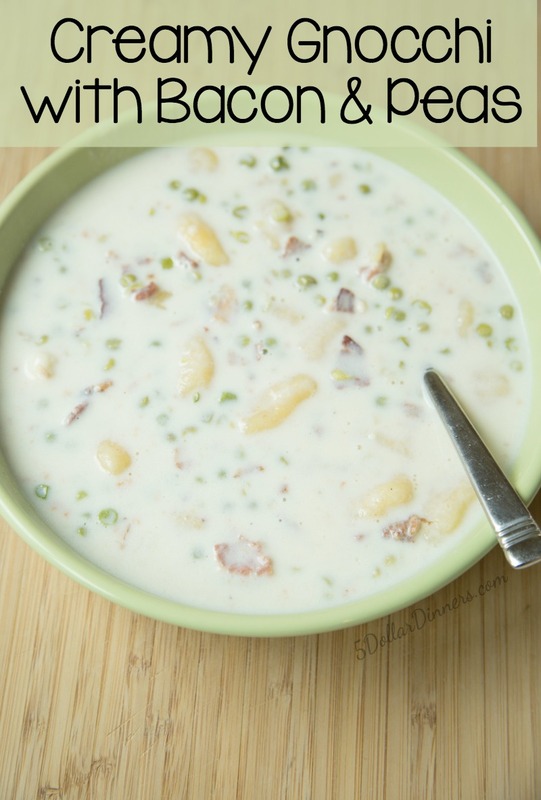 Your Creamy Gnocchi with Bacon and Peas recipe looks so yummy, I am craving for this. I cannot wait to try this super healthy recipe for healthy eating. This is what my friends also looking for, fresh, delicious and nutritious. Thank you so much.! I am now a huge fan of your recipes. Keep updating! Great blog! Would almond milk work in place of rice milk for dairy free?